The WM-80 multiple launch rocket system was developed by China North Industries Group Corporation (NORINCO) based on the indigenous Type 83 273mm 4-tube artillery rocket system. 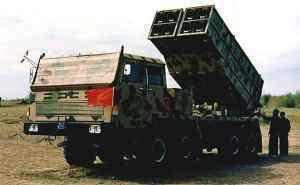 The WM-80 did not enter PLA service, possibly due to the introduction of the more capable A-100 artillery rocket system. NORINCO has been promoting the weapon system to the export market and made one sale to Armenia in 1999. NORINCO introduced the truck-mounted WM-80 273mm multiple launch rocket system in the 1990s as a follow on to the tracked chassis-mounted Type 83 developed in the early 1980s. 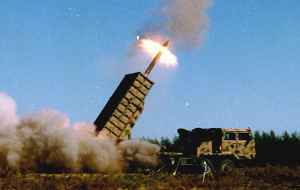 China’s first advanced artillery rocket system, the WM-80 was upgraded with a number of new features to improve its performance, including a computerised fire-control system and modular launcher box design for fast reloading. With a maximum firing range of 80km, the weapon system was intended to be used at corps-level to provide long-range intensive firepower against large area targets. Despite the advanced design and outstanding performance, the WM-80 was not adopted by the PLA, possibly due to the introduction of the more capable A-100 300mm multiple launch rocket system. The WM-80 was promoted by NORINCO to the international market in the mid-1990s. There has only been one reported sale to the Armenia Army, which took delivery of four units in 1999. The WM-80’s launcher adopts a modular design, with two launcher boxes each containing four ready-to-launch rocket rounds. After these four rockets are launched, the whole launcher box is removed using the crane on the reloading truck, and a new launcher box containing 4 new rounds are loaded directly on the launch truck. This design avoids the reloading of the rockets individually and thus greatly reduces the reloading time. The launcher boxes can also be used to fire different calibre rockets with minimum modifications. The launcher is mounted on a electrically operated turntable with an elevation range of 20° to 60° and azimuth range of -20° to +20°. 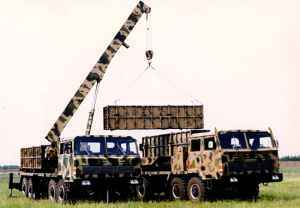 The multiple launch rocket system is mounted on a Taian TAS5380 8X8 truck chassis. To provide a more stable firing platform, four hydraulic stabilisers are lowered to the ground two either side. The fully enclosed four-door cab shelters a crew of five. To protect the front windows when the rockets are fired special shutters are activated from inside the vehicle. Inside the cab is the fire-control system that typically receives information from the battery or regimental headquarters, as well as the system for launching the rockets individually or in a salvo. Rockets are normally launched at five second intervals. There is also a standard optical sighting system on the left side of the launcher as an emergency back up. If required the rockets can also be launched by remote control away from the launcher. Each launch truck is supported by a reloading truck based on the same 8x8 truck chassis. The reloading truck carries two spare launcher boxes each containing four rockets. A hydraulically operated crane mounted to the rear of the cab is used to remove the expended rocket pods from the launcher and install new ones. According to NORINCO, it takes between five and eight minutes to reload a launcher with two new launcher boxes. The WM-80 fires 273mm free rockets. Each rocket is 4,582mm long and weighs 505kg. When fired, the rockets carrying 150kg warhead reach a maximum height of 31,000m and out to maximum range of 80km. Time of flight is about 165 seconds. Minimum range is 34,000m and circular error probable (CEP) is quoted as between 12% of range. The rocket is stabilised by tail fins and high-speed spin generated by a spin motor. Two type of warheads have been developed by NORINCO: High-Explosive (HE) blast and submunitions. The HE blast warhead contains 34kg of explosive that can be activated by a WJ-6A mechanical impact fuse or a MD-23A electronic proximity fuse. For some types of terrain the impact fuse would be selected while for other types of terrain or target the proximity fuse would be used to burst the rocket over the target for maximum impact. 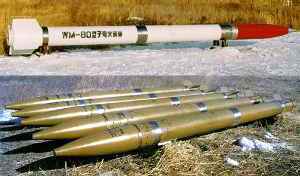 The submunition warhead is typically used against concentrations of troops, and contains 380 bomblets with a HEAT (high explosive anti-tank) warhead. Each of these will penetrate between 80mm and 100mm of conventional steel armour. This would penetrate the vulnerable upper surfaces of tanks and other armoured vehicles.